Now, as it turned out that SpaceChem comparison isn’t that valid. 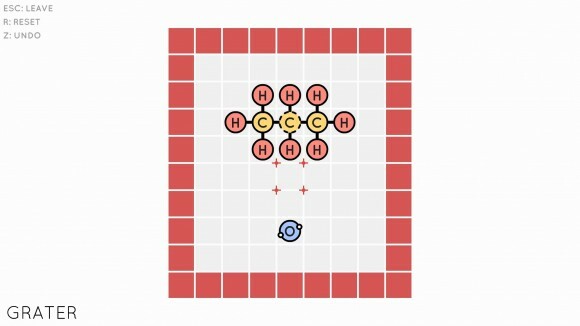 SpaceChem was a comprehensive game that gave you the tools to build a freeform system that would produce the desired molecule and left you to get on with it, with each level sometimes taking multiple hours to figure out. Sokobond is a much lighter puzzle game whose challenge arises from the restrictions it places on the player, and whose levels are often over in a matter of seconds if you spot the trick behind them early. 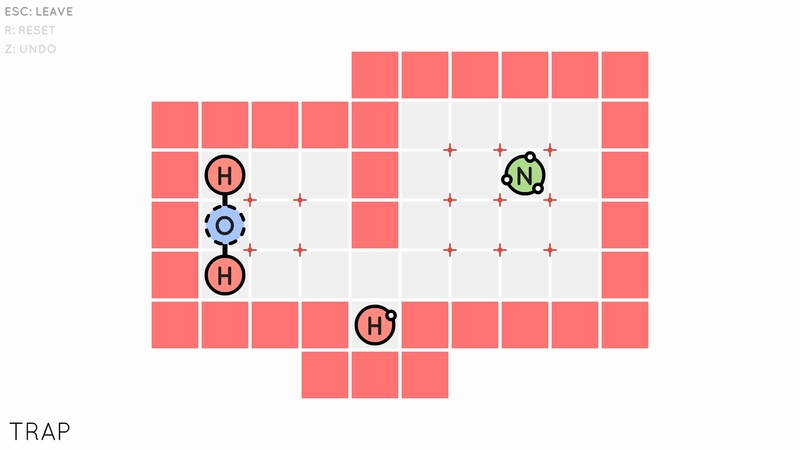 There has been an intentional decision to drastically limit the number of ways you can manipulate the various atoms as you try to construct a given molecule, making Sokobond a very simple game at heart. That’s okay; so is Sudoku. It does mean, however, that Sokobond lives — or dies — on the strength of its level design, which needs to provide enough variety and complexity to compensate for those relatively simplistic mechanics. It is to Sokobond’s great credit (and to my great surprise) that it mostly succeeds. First, though, what is Sokobond? 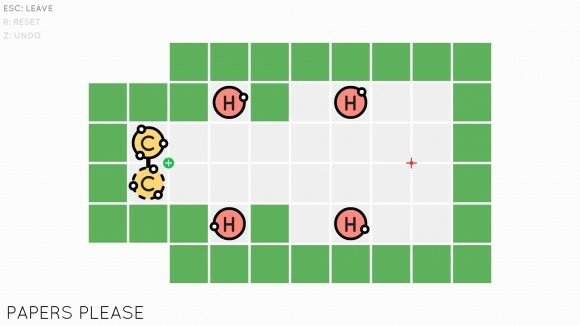 It’s a faux-science-y puzzler based around bonding together individual atoms to create molecules. You start each level with control of a single atom, which can be moved around using the arrow keys. This atom will have one or more little circles orbiting around its outer edge, each or which represents a free electron in the atom’s outer shell. Move the atom next to another atom that also has a free electron and the two will bond together, and the next time you move your control atom it’ll drag the bonded atom along with it. Your job is to use your control atom to connect up all the atoms on the level in such a way that none of them have free electrons left, thus constructing a stable molecule. And that’s basically Sokobond. I told you it was simple. Sokobond’s challenge arises from two key elements. 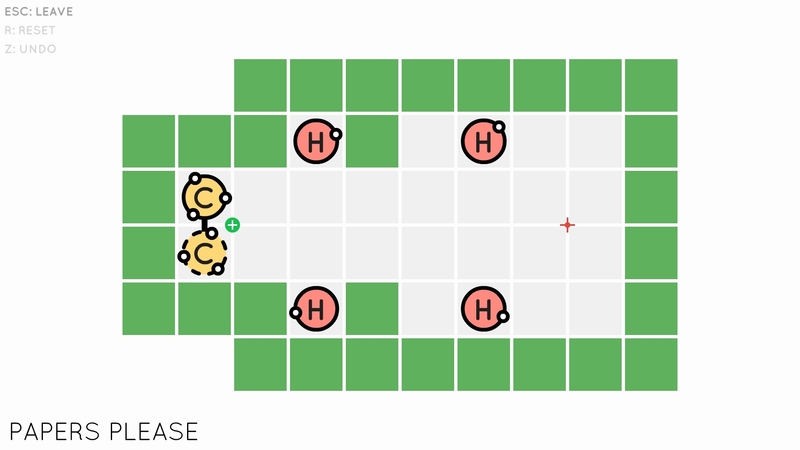 The first is that you don’t have any control over whether two atoms bond or not; if they’re in adjacent squares and they each have a free electron they will bond together, and this is a hell of a restriction when combined with the clever level layouts. For example, if you accidentally bond your molecule together into something three atoms wide and you have to get it through a gap that’s only two atoms wide, you’re screwed. Hydrogen atoms only have a single electron in the outer shell and which can therefore only make a single bond each; if you nudge together two hydrogen atoms that aren’t connected to your main molecule and they bond, you’re screwed because there’s usually no way to separate them. Often you’re called upon to manipulate atoms that you don’t want to bond with yet, and must push them around using inert atoms that have already used up all of their free electrons in pre-existing bonds. Because of all this it’s easy to get to a position where a level becomes unwinnable, but Sokobond realises that this is potentially the most annoying thing a puzzle game can do and does everything it can to keep your blood pressure low, either allowing you to step back through your moves one at a time until you a reach a point before you fucked everything up, or else reset the entire level to the beginning. You’ll end up making extensive use of these rewind functions, especially during later levels where it introduces additional mechanics like squares that break molecular bonds or rotate molecules when you move over them, or the inert helium atoms that nearly always have to be used as buffers to push other atoms around without bonding with them; despite its apparent simplicity Sokobond uses these three or four extra mechanics along with some extremely well thought-out level design to keep things interesting. It means one of those alarm bells that rung when I bought it turned out to be a false one; Sokobond is both simple and clever, with a design that truly is elegant. However (and there was always going to be a “however”) I wouldn’t call it deep. No matter how clever it is, Sokobond can’t escape the limits of its own self-imposed simplicity. This is most immediately apparent in the game’s length; there’s around fifty or sixty levels in the game, and I estimate I’ve done about two thirds of them in just over two hours of play. Each level is a bite-size puzzle that’s immaculately well-designed but few of them take more than a couple of minutes to figure out, and no game can sustain that pace of content consumption for long. I don’t think this would have been a particular problem – for £6 I would have been perfectly happy with a three hour game just so long as it was consistently entertaining for all of those three hours – except the longer I played it the more the game’s approach to the actual science of chemistry bothered me. Or rather, the game’s total lack of one. Okay, so, you know all that stuff I just said about free electrons and molecular bonding? The thing that is Sokobond’s core mechanic? That’s far more information than Sokobond itself will give you; it seems stunningly uninterested in educating or informing the player in any way, and even when it comes to playing the damn thing you have to figure out what to do by trial and error. Sokobond doesn’t even tell you what the molecule you’re supposed to be making on each level is, instead forcing you to infer it from the number of free electrons present on each atom. It gets away with this trial and error approach to teaching the gameplay because it’s so damn simple, but the same can’t be said of the science; because there is almost no explanation of what you’re doing or why you’re doing it, it is impossible to get invested in Sokobond. It’s effectively abstracted the science out of the game, jettisoning every aspect of it that’s not directly relevant to the puzzles and reducing the rest of it to nothing but a thin veneer plastered over the top in an attempt to give itself a false air of respectability. The science, in short, is yet another casualty of Sokobond’s minimalist approach, and reduces it to nothing more than the sum of its parts. You know why SpaceChem was so good? 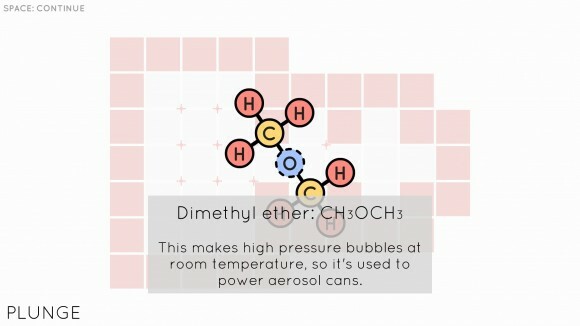 It wasn’t because it taught you about science or chemistry, because SpaceChem was secretly about neither of these things, but it did teach you about programming, and if you weren’t already a programmer you probably came away from SpaceChem noticeably smarter than you were when you started it. I can’t say the same for Sokobond; you won’t learn anything from it except how to solve Sokobond puzzles, and this is probably the game’s biggest missed opportunity. Sokobond looks pretty and is intelligently made, but it desperately needed an injection of context in order to transcend its own ultimately limited nature. As it is it’s just another puzzler, albeit a clever one. Totally off-topic but what’s your impression on the Cosmos: A SpaceTime Odyssey TV series? This would make a really good standalone post. Is it on Netflix or iPlayer? As I understand it’s free on Hulu but I can’t check cause I’m not from USA. I’ve bought Spaceshem some time ago. And it was just waiting there. I’m tired of listening how great it is. I’m serious now. I’m making a desktop icon. Now I’ll have something to answer when my boss asks me about my programming self development apart from android games. Is that what you wanted?! Are you satisfied?! Yes. Everyone should try SpaceChem. It is the only game I have ever played that’s made me think so hard I’ve given myself a headache. And that’s really the only quote they need for the store page. If you’d be a truly good man, sir, you’d get into people houses at night and forced them to place SpaceChem. After several planets I got some forgotten children feeling of finishing really cool and hard levels and beating most of the gamers of the world in effectiveness. It puts you over and over through the loop of understanding that your mother lied to you every time she said you are not retarded and realizing later that your brain is awesome and can find its own original solution to openended puzzles.